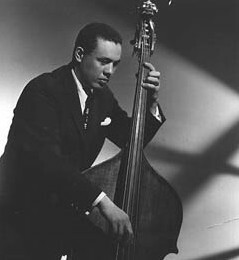 Mercurial and gifted bassist and band leader Charles Mingus is considered by many to be one of the jazz greats of all time, and one of the 20th Century’s most important black composers. He worked and recorded with jazz legends such as Miles Davis, Art Tatum, Eric Dolphy, Charlie Parker, Dizzy Gillespie, and Max Roach. With the latter four, he played bass in the famous recorded live jazz concert “Jazz at Massey Hall” in May 1953. By the 1950s Mingus had settled in New York, after touring in the 1940s with the bands of Louis Armstrong and Lionel Hampton. While in New York he further developed his association with some of the leading jazz musicians of the era. He also founded his own recording and publishing companies to protect the growing body of his original work. The National Endowment for the Arts, The Smithsonian Institution, and the Guggenheim Foundation awarded Mingus grants. He taught music composition at The State University of New York at Buffalo, and received an honorary degree from Brandeis University. Mingus was diagnosed with amyotrophic lateral sclerosis (ALS or “Lou Gehrig’s disease”) in 1977, and died at age 56 in Mexico on January 5, 1979. The Charles Mingus Collection is in the Library of Congress. Charlotte Greig, Icons of Black Music (San Diego: Thunder Bay Press, 1999); www.mingusmingusmingus.com; www.pbs.org/jazz.